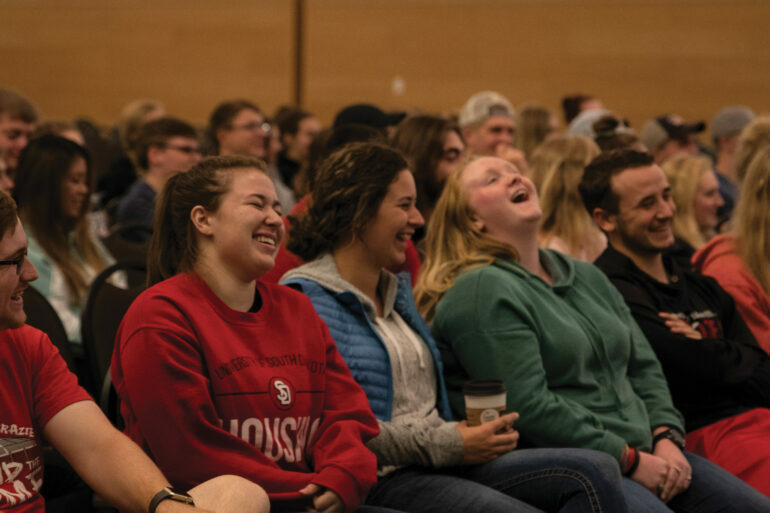 A crowd of students gathered in the Muenster University Center ballroom to learn about sexual assault on Monday and Tuesday during a new university training. The Hook Up event aims to teach students about sexual assault in a way that is beyond the policies and rules surrounding it. Kailin Madinger, a sophomore elementary education and special education double major, said sexual assault awareness is something that needs to be addressed especially in a college town. Laura Anderton, director of sorority and fraternity life and leadership, said there are two reasons sexual assault training is important: the policy reason and the real reason. The policies are the rules that the university devised when dealing with sexual assault. Sororities and fraternities are required to have 75 percent of their active members trained in sexual assault scenarios prior to Dakota Days. She said the purpose of these policies is to educate students to mitigate the risks of it happening. “The reality is it is happening on our campus and it’s not just happening in our Greek community, it is happening across our whole university community,” Anderton said. The Interfraternity Council is currently working on promises that reiterate the fact that they will not stand for this behavior in their community. The Hook Up event took place on Monday and Tuesday. The event was piloted last spring and focuses on crowd engagement. It takes the idea of a good hook up compared to a bad hookup and where the line is drawn between a bad hookup and sexual assault. Baylie Embry, a sophomore secondary math education major, said she attended the event because it was mandatory for her sorority, but she was surprised with how much she enjoyed it. Rachel Hohenstein, a sophomore nursing major and PAVE treasurer, said attending this event because it promotes the same values PAVE promotes. “PAVE stands for promoting awareness, victim empowerment, we promote consent and we promote safety and victim empowerment, if something happens to you we want to know your story and we want to make sure that you know you are validated and we believe you and that you have these resources,” Hohenstein said. Hohenstein said she believes all students should be educated on sexual assault and said attending the Hook Up is a good way to start. Anderton said she believes this program is more successful than those of the past because it gives students scenarios they can relate to which makes it easier to know what to look for. Although Anderton said she thinks the policies are important, the past programs have not engaged students.